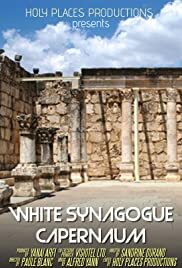 Holy places TV take you to Capernaum to visit the White Synagogue. The name of the city was originally Kfar Nahum [ney-huh m], which means "The village of ahum". (Named after somebody called Nahum) The name of the village was translated as Capernaum by the Greeks, and the word is used in the Gospels and by Joseph Flavius in his writings. Thus, we keep saying Capernaum in the modern language.